If private lenders are allowed back into the federal student loan program — a program from which they were removed during the Obama administration under the Affordable Care Act of 2010 — it would preclude “universal access to student loans at universal terms,” a new paper released Wednesday states. “If policymakers believe the most important goal is to provide widespread access to loans at terms the government sets, then there is nothing private capital can offer over the Direct Loan program,” Jason D. Delisle, a resident fellow at the American Enterprise Institute’s Center on Higher Education Reform, argues in the paper. The paper — titled “Private in Name Only: Lessons from the Defunct Guaranteed Student Loan Program” — was released in conjunction with an AEI forum on the issue of using private capital to reform federal student loans. And it comes at a time when questions abound about whether the administration of President Donald J. Trump and a Republican-controlled Congress will seek to revert to the bank-based system that President Barack Obama and a Democratic-controlled Congress scrapped back in 2010 — something both Trump and a key Republican lawmaker have indicated they hope to do. At the forum, some panelists called for a simplification of both the federal student loan and repayment process. Beth Akers, a senior fellow at the Manhattan Institute, said the roughly half dozen different federal loans and a large menu of repayment plans makes things complicated for students and families. James P. Bergeron, president of the National Council of Higher Education Resources, said students need more information about what is the best college to attend, the best loan product or form of federal financial aid to finance their higher education, and what is the best repayment option based on their unique needs. “The overall issue that federal policymakers need to focus on is whether or not the federal government is running a student loan program or whether it’s running student assistance program, because those are two very distinct items and they’re very distinct products,” Bergeron said. 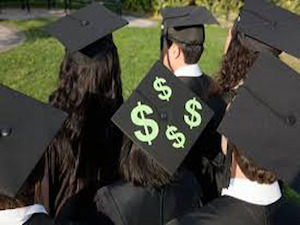 Rob Lavet, general counsel at SoFi — a finance company whose name is shorthand for Social Finance — questioned whether institutions of higher education that have large endowments should even be allowed to participate in the student loan program. Zakiya Smith, strategy director for finance and federal strategy at the Lumina Foundation, an Indianapolis-headquartered organization that focuses on increasing America’s postsecondary attainment, said it is important to reform the federal student loan system in ways that “ameliorate” the feeling that students loans are too difficult to repay. Too many students take out loans without being told how much they will owe at the end or what their monthly payments will be, Smith said. “People will be frustrated and resentful of the process without information,” Smith said. In his paper and his talk, Delisle noted that President Trump, as well as U.S. Rep. Virginia Foxx, R-N.C., chairwoman of the House Committee on Education and the Workforce, have indicated they want to bring banks back into the system and get the government out of student loans. A Democratic committee aide told Diverse Wednesday that the Direct Loan program is more effective. They also said going back to the old Federal Family Education Loan, or FFEL, program would amount to taking billions of dollars and handing it to private lenders, whereas the switch to the Direct Loan program resulted in a savings of $60 billion to taxpayers over 10 years. Moreover, much of the savings were redirected into the Pell Grant program. Delisle — a former Republican staff analyst for the U.S. Senate Committee on the Budget — makes similar points in his paper. The paper takes aim at critics who say FFEL was more efficient than the Direct Loan program and that the switch to the Direct Loan program is what caused the “student loan explosion” and high loan delinquency rates. “Private lenders might have had lower administrative costs than the government, but by design the FFEL program rendered these savings irrelevant for taxpayers by compensating lenders at arbitrarily high rates set in law,” the paper states. The paper states there is no causal relationship between the switch to the Direct Loan system and the 2012 milestone in which student loan debt surpassed the $1 trillion mark. Rather, the paper argues, the increased student debt was the result of a more complicated picture that involved a “large wave of nontraditional students enrolled in institutions of higher education” after the recession and who took out federal student loans.